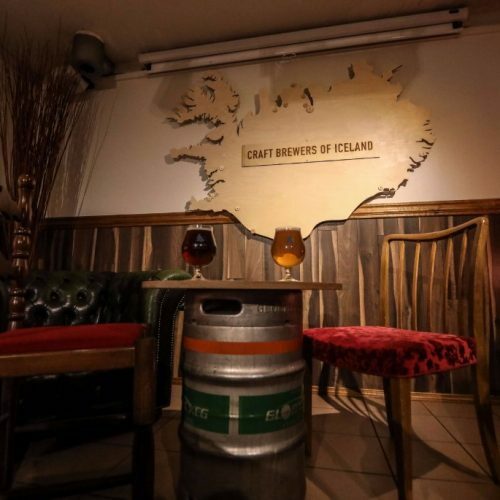 Einstök Ölgerð® is located just 60 miles south of the Arctic circle in the fishing port of Akureyri, Iceland, where we invite you to visit our Brewer’s Lounge and enjoying our craft ales at their freshest. Here in Akureyri, we brew beer with the purest water in the world: glacier water. From there, we add the finest ingredients we can find in Iceland, as well as other parts of the world. Now, we have the pleasure of welcoming you and your clan to enjoy these award-winning beers in their freshest state, straight from the brewery. 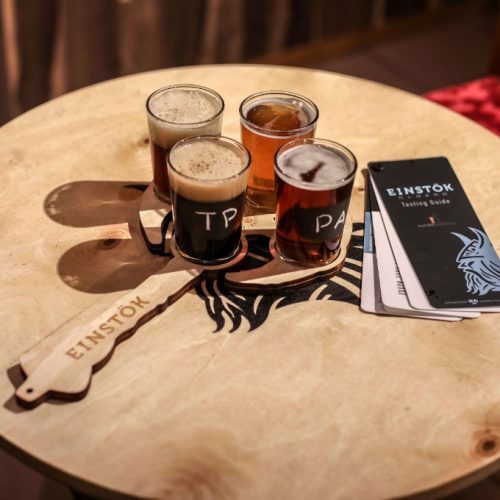 Our aim is to create a relaxing atmosphere for visitors to join our adventure, as well as a place where our brewers will feel inspired to conjure up the next batch of refreshingly drinkable craft beers for the world to enjoy. 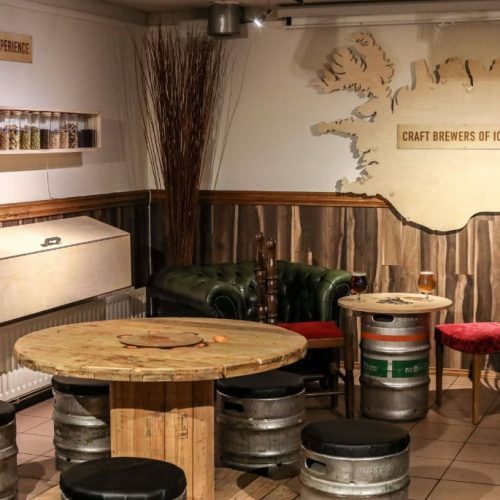 We are located at the upper floor with our friends at Ölstofa Akureyrar, who pride them selves in a great selection of local beers. Wheat malt, pilsner malt, oats, Bavarian noble hops, coriander, and orange peel. Pale ale malt, crystal malt, chocolate malt, American and Bavarian hops. Lager malt, Munich malt, chocolate malt, Bavarian hops, and authentic Icelandic roasted coffee. Smoked Icelandic barley, pale ale malt, crystal malt, chocolate malt, Bavarian hops and Icelandic angelica root. Munich malt, pilsner malt, crystal malt, chocolate malt and Bavarian hops. 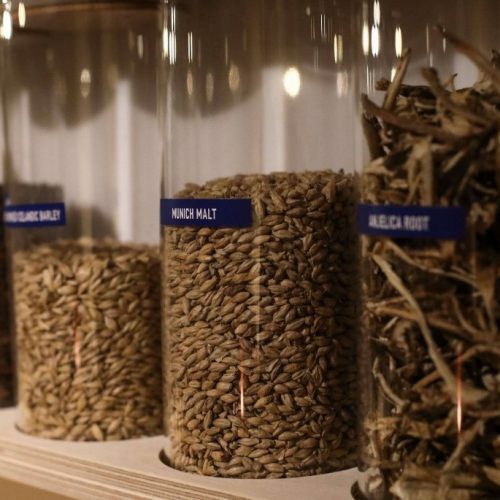 Wheat malt, pilsner malt, oats, Bavarian hops and hand-picked Icelandic bilberries. 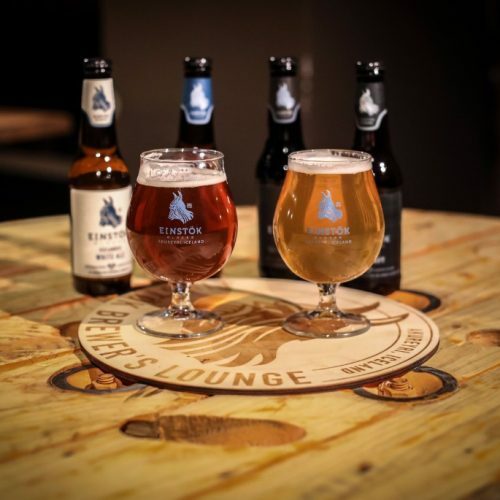 The Brewer’s Lounge is the ideal place to sit back and sample these award-winning beers. 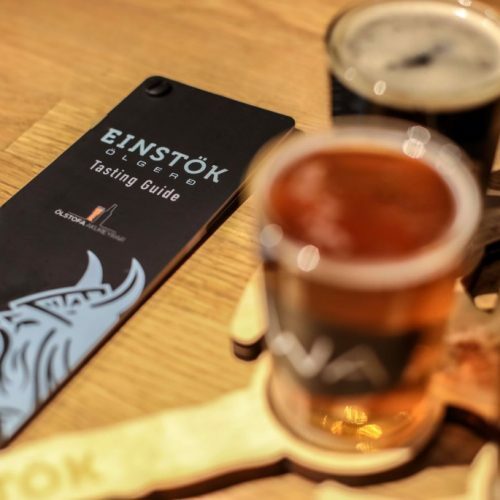 At the ground floor of Ölstofa Akureyrar, Sigtryggur and his crew are eager to serve you any available beers you would like to try on our sampling axe. Yup, no sampling trays for us, we serve our tasting experience on an axe. You will also get a small deck of cards that will help to guide you through the sampling experience at your own pace. Our beers are carefully crafted using only the finest ingredients, which we proudly showcase inside our lounge. On a backlit shelf on the wall, you will find all of the grains, malts, hops and other ingredients we brew with. Some, such as our whole cascade hops, birch smoked Icelandic barley & chocolate malt, you are invited to touch and smell. Our most vital ingredient, pure glacier water from Hlíðarfjall, you can find and taste all around Akureyri, straight from any water tap. Don’t miss the opportunity to grab a swig of the freshest water on earth. This place is one of my favourite because they serve all Einstök, which is my favourite local beer. ©2018, Einstök Beer Company, LP. All rights reserved. This unique craft brew is meant to be savored responsibly.